I started to learn erhu when I was 12 years old from teacher Jiang of china conservatory of music.My grandpa bought me the first erhu.I deeply love it and practiced so hard at that time. 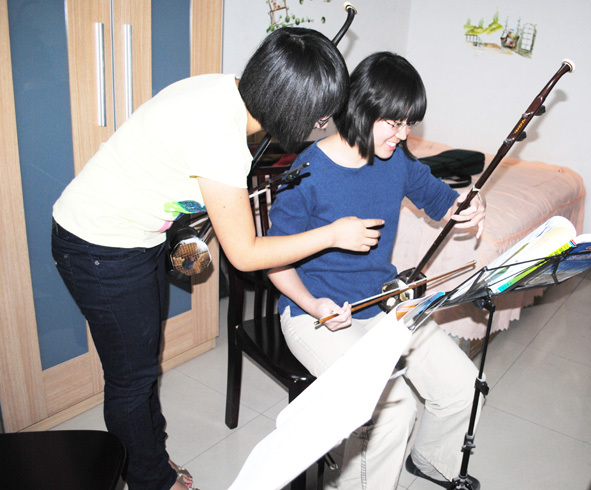 It’s erhu that makes me proud and enjoy such good times. I got the Certificate of Arts Grade Examination of China of 9 grade. Ocassionally,I have such idea to teach Erhu due to a foreign guy I know who wanna play erhu but difficult finding erhu teachers with English. Now,among my students in Beijing,there are cello musician,scentist,international students and even students who learned via webcam with me. I select different ways which suit for kinds of students with their different background on erhu teaching. At the same time, I focus more on basic skills like erhu-holding,bows, intonation…for only in this way can player continue to learn it better I suppose. Does Erhu easy to learn? For beginners and also compared with violin,erhu is much easier to learn.One of my French students can play Edelweiss after 3 lessons(1hour for each). And the erhu book students used contain both staff and numberal musical notation to players who know some music or know nothing. Erhu has strong performance,so just depends on the music you’ll play.Maybe take some well-known short songs at the beginning and then some outstanding erhu music. Thinking about the Erhu’s future? I would say there are much more space for erhu development. Today,Erhu frequently appears in the Golden Hall in Vienna that shock on the world and the people who love music. Erhu is not only for Chinese, but also belongs to the whole world. In brief,in my eyes,erhu will surely has a brighter future so that more people feel the charm of erhu and more to enjoy it! I hope Erhu can bring happiness to each lucky player.